Home ground advantage is often overlooked, underrated, or just plain cocked up in fixture analysis. Which is strange, because it’s one of the most reliable predictors. We don’t know whether a team’s double-up opponents will become tougher or weaker in 2018, but we do know it’s always better to play interstate opponents at home. In theory, all teams should face a balanced fixture, and travel to face interstate opponents the same number of times as they host them at home. But in practice, this doesn’t happen. Some teams enjoy home games against interstate opponents while staying local for their away games, and sometimes teams play “away” games at their home ground, with their opponents forced to travel to them. This is home ground advantage fixture bias. 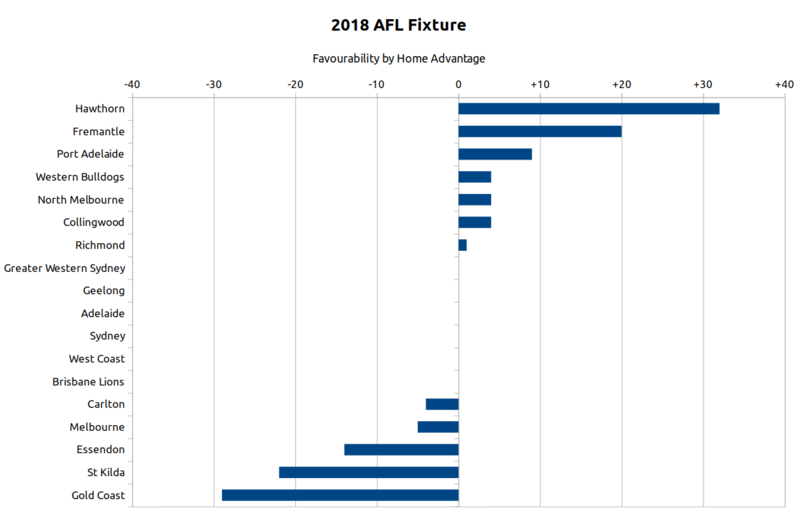 The AFL does a pretty good job of managing it, but each year there are imbalances, with some sides coming out better than others, playing more games at favourable venues than unfavourable ones. While it’s not the only factor in fixture difficulty, I think it’s important enough to take a closer look. So in this post, I analyze every team’s fixture and discuss why it’s good, bad, or break-even. Favourabity is the net total of points a team receives from home ground advantage during the season. Throughout 2018, Hawthorn will receive a net benefit of a little over five goals from home ground advantage, while the Suns will be penalized almost the same amount. Interstate advantage (+10): a team hosts an opponent who travels from interstate. This includes Geelong home games against Melbourne-based sides, given the Cats’ superb record there. Local advantage (+1): a team hosts an opponent located in the same city. Limited advantage (+5): a few specific cases: a Melbourne-based team hosting Geelong at the MCG or Docklands, Hawthorn or North Melbourne hosting a Melbourne-based team in Tasmania, and Melbourne hosting a Melbourne-based team in Darwin. These numbers are, I think, generally accepted in AFL analytics. That is, it’s commonly agreed that interstate home advantage is worth somewhere in the realm of 10 points, while the advantage of playing a local team in your own city is almost negligible. If you want to adjust them a couple of points either way, though, I won’t quibble. The Hawks travel to face interstate opponents four times, the fewest in the league, while interstate teams have to travel to face them six times, a league-high two-game discrepancy in their favour. On top of that, they play Geelong at home, which is worth +5, and they also have an “away” game against the Cats at the same venue. This effectively gives the Hawks 12 home games for the year, eight of which are against non-Melbourne sides. That’s a remarkable number, only just short of the ten games that non-Victorian sides typically receive. In fact, it’s the same number as Gold Coast, who have to travel seven more times than the Hawks do to face interstate opponents. And that’s not all: Hawthorn also take St. Kilda to Tasmania, which turns a +1 game into +5. The net result is a 32 point bonus over the course of the season. Fremantle are the lucky recipient of an “away” game against Gold Coast in Perth due to the unavailability of Carrara due to Commonwealth Games renovations. This transforms the game from -10 to +10, giving the Dockers 11 games with interstate advantage in their favour and only nine against. 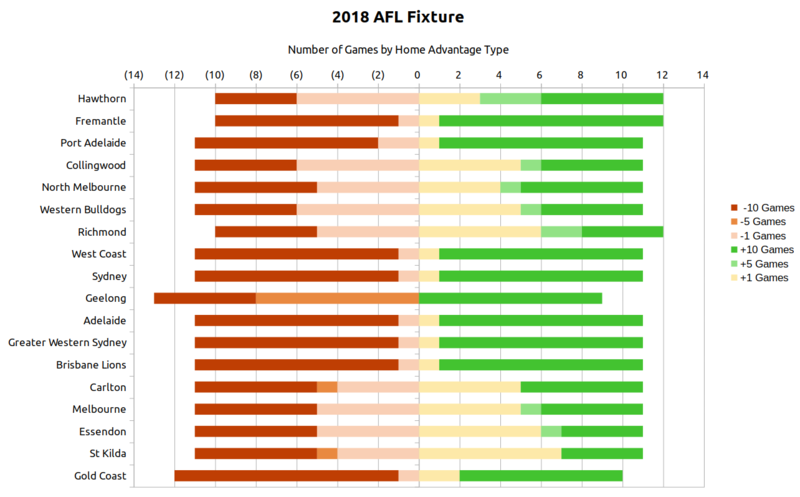 Port Adelaide’s otherwise balanced fixture is tilted in their favour by playing Gold Coast at a neutral venue (China) instead of at the Suns’ home ground. 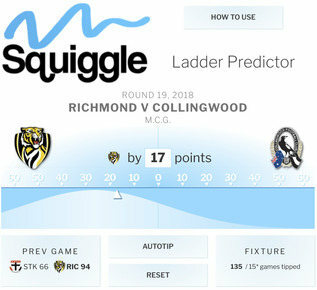 Collingwood’s fixture is mostly balanced, with five interstate home games and five interstate away, but they benefit from playing Geelong at the MCG. but they also have a game against Geelong at the Docklands, a venue in their favour. Like Hawthorn, North benefit from dragging a Melbourne-based team to Tasmania, turning what should be a +1 game against the Saints into +5. Otherwise their fixture is balanced. Richmond host interstate teams only four times, equal fewest in the league, while having to travel interstate themselves five times. But they more than make up for this by receiving two games against Geelong at the MCG, one of which is a nominal away game. Geelong play just nine games at their true home and 13 games away, which is an enormous discrepancy. But since their Kardinia games are all rated +10 while their MCG and Docklands games are only -5, they come out even on balance. Sydney’s fixture is neatly balanced with 10 interstate games away, 10 at home, and 2 local bridge battles or whatever they’re called. The Giants have a balanced fixture that is typical for non-Victorian sides, with ten interstate games away, ten at home, and two local bridge busters. Adelaide’s fixture is neatly balanced with ten interstate games away, ten at home, and two local showdowns. Brisbane’s fixture is neatly balanced with 10 interstate games away, 10 at home, and 2 local Q-Clashes. West Coast’s fixture is neatly balanced with 10 interstate games away, 10 at home, and 2 local derbies. Carlton’s otherwise symmetrical fixture is tarnished by having to travel to Tasmania to play North Melbourne, turning what should be a -1 game into a -5 game. This analysis may be too optimistic on Melbourne, even though they’re ranked fourth-last. That’s because the Demons host Adelaide and Fremantle in the Northern Territory, and these are classified as +10 games in Melbourne’s favour (hosting an interstate side at an alternative home ground), even though in practice, geography and history suggests it may not be deserved. Essendon host interstate teams only four times but must travel away six times. They get a game against the Cats at the MCG, which helps, but not enough. At least there’s a plausible explanation for Gold Coast’s terrible fixture: the unavailability of their home ground. What’s behind St. Kilda’s shafting, I can’t say. Firstly, the Saints host interstate sides only four times while traveling six times, which is a heavy imbalance in itself. But whereas Essendon are compensated for the same issue with an MCG game against the Cats, there’s no such balm for the Saints, who are bound for Kardinia Park. They also must travel to Tasmania to play Hawthorn, which turns a -1 game into -5. The Suns immediately drop 20 points by playing a home game against Fremantle in Perth, which turns what should be a +10 game into -10. Then there’s a home game against Port Adelaide in China, knocking down a +10 game to +1 (nominal home team in neutral venue). It leaves them with 11 games where interstate advantage will work against them and only eight when it will be in their favour.